The bell, it would seem, has tolled, because WWE is finally producing a career-spanning documentary on “The Phenom”, The Undertaker! Good ol’ JR revealed the news on social media late last week, along with a photo of himself and his recently departed wife Jan standing beside ‘Taker. Jim Ross was interviewed by a WWE camera crew for the purpose of the documentary on what would officially be the final day of his contract with the company after some 26 years of service. 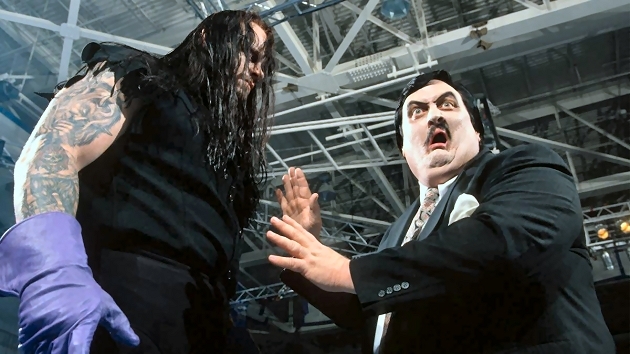 We can confirm that the project has been green-lighted, however we’ve learned from a source in the know that an Undertaker documentary feature does not (currently) appear on WWE’s 2019 schedule — we wouldn’t rule out that changing, or the documentary seeing a physical Home Video offering in the future, but as of right now, sadly, this one may not be a DVD release. Speaking of a documentary that didn’t wind up on DVD immediately (but will be released this month! ), it’s time for a first look at: Andre The Giant. Here’s a glimpse of the main menu and extras selection for the new Andre The Giant DVD ahead of its release beginning April 30th. Get your pre-orders in by clicking here to Amazon.com. The runtime of the documentary feature on DVD is approximately 1 hour and 25 minutes which looks to be identical to the length of the original HBO version, but here we’re also treated to a selection of Andre’s biggest matches between the years 1978 and 1988, as special features. – United States: April 30th. Get your copy of the Andre DVD here on Amazon.com. – UK/Europe: May 6th. Pre-order the new Andre The Giant DVD now via Amazon.co.uk. – Australia: June 19th. Your pre-order opportunity just went live over at Madman.com.au. On this very day last year it was announced that for the first time ever the WrestleMania DVD would, in addition to The Showcase of the Immortals, include the weekend’s NXT TakeOver special. Luckily, it wasn’t an April Fool’s gag then and it isn’t today either — WrestleMania 35 will include an NXT TakeOver: New York bonus disc! This will once again be a limited edition offered exclusively to fans in the UK. Last year, ASDA stocked the bonus in the form of a 4-disc DVD package in their stores. WWE Home Video UK would bundle the NXT TakeOver bonus disc with both the DVD and Blu-ray of WrestleMania online through their webstore. A similar release strategy appears to be planned this year. For all you lucky customers who pre-order online with us on either DVD or Blu-ray, you will receive the Limited Edition Online Exclusive version that will contain the NXT TakeOver: New York bonus DVD disc inside! This bonus DVD will feature the full NXT TakeOver event scheduled for the 6th of April – one day before WrestleMania 35. Will they talk about his unfair treatment to DDP in the 2001 summer? His stupid heel turn in November 2001? Him staying on Smackdown to avoid having better matches with WCW stars, Goldberg & Scott Steiner in 2003? Him looking effortlessly as the Undertaker since his 2004 return? Him and Triple H basically acting like how Hogan & Flair did in the last years of WCW? Better matches with Scott Steiner or Goldberg? Not even Triple H could have good matches with either guy in 2003. The Hall Of Fame is definitely not being released with this set. With WrestleMania 35 currently having 15 matches officially announced, plus maybe 1 or 2 more that haven’t been announced yet, not to mention the WWE Network schedule listing the main PPV as running from 7pm EST to 12:30am EST, there’s no way the DVD/BD release will include the Hall Of Fame ceremony. Between the main show and the Kickoff matches, we’re looking at nearly 7 hours right there. In order for the Hall Of Fame to be included it would have to be a 4-disc DVD set and a 3-disc BD set. It clearly says this will only be a 3-disc DVD set and a 2-disc BD set. So Europe gets the NXT event. If the US doesn’t get anything (and I mean only the PPV and no Hall of Fame), I will be upset. Maybe include some unreleased matches as well. An Undertaker HOF induction would have been the ideal way to end this set, but that ball was bungled and dropped. Is there any plan for a Ronda Rousey compilation? That seems inevitable this year. A full lengthy Becky Lynch doc looks to be a given at this point. She really does have a compelling story. Really? If AJ Styles didn’t get a documentary set I fail to see how Becky Lynch is a “given”. Many top stars have not yet had documentaries. Rollins, Reigns etc. Could be a sign that this year is ‘Taker’s last! I’ve been hearing that since ’99. Huh? I’m specifically linking the possibility to the announcement of this documentary. Yeah and I’ve been hearing about Taker retiring ever since he got injured in 1999 and was gone for 8 months. Every time he disappears for a while, people always look for reasons to say he’s done. He’s out injured, must be retiring. He had serious surgery, must be retiring. Paul Bearer passes away, must be retiring. Brock ended the streak, must be retiring. He layed down his hat and coat in the ring at WM33, must be retiring. Saying “he’s got a documentary, he must be retiring” is the same thing. Yes, but in 1999 he was 20 years younger, so with all due respect, we’re twenty years closer to that prediction actually being true this time, aren’t we? Add to that fact that he clearly can’t go anywhere (see ‘Mania 33, Super Show-Down, Crown Jewel etc. ), and I’m not sure why you think it’s so unthinkable that this year might be his last. It’s not 1999 anymore. And there he was on Raw last night. Lol As long as Taker can continue to throw punches and do a chokeslam, he’ll never officially be retired. I was exploring this POSSIBILITY of this year being his last and clearly nowhere stated that he wouldn’t be returning this week; I even expected it. But yeah… I knew you’d jump on that. I just hope this year wrestlemania 35 DVD would include the Hall of Fame ceremony in it. As last year HOF only can view from website, its really not complete in my ppv collection. Why doesn’t the US get NXT takeover this is complete crap! I’m from the UK so I think it’s WONDERFUUUUUL, YEEEEHASSS! I hope the documentary is actually in depth and career spanning rather than Undertaker sitting in a car for an hour on the way to WWE headquarters. Lol, yeah! 🙂 Like the Sting doc. Still not convinced that this Undertaker doc isn’t gonna be 55 minutes long and be centred around him preparing for one WrestleMania event, but we’ll see. Idk if the same happened for Sting in the WM31 episode but the WM33 episode of WWE24 already had Taker in a car heading to where ever he was heading to so if that’s not reason enough not to feature that format on the doc I really can’t think of any aside from I don’t believe fans – myself included – want that format. 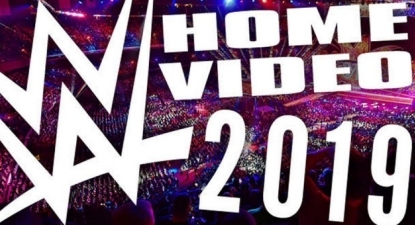 Will the WM 35 DVD arriving in the USA and such mid-next month be including the 2019 WWE HOF Ceremony in full or will it [instead] include the post RAW and Smackdown episodes, and if I remember correctly, the HOF was not included in last year’s WM 34 DVD set. I honestly preferred the following episodes approach. I rarely go back and watch anything from past Hall of Fames, but the Raw/SD following Mania usually feature huge surprised and debuts. Makes sense to me.